Between January and October 2017, TDLWD approved nearly 124,000 WOTC applications, totaling over $322 million in tax credits to Tennessee employers. The state has already far surpassed the total number of certifications made in all of 2016. Eligible workers must come from targeted groups who consistently have a difficult time entering or reentering the labor force. Those groups include persons who have been unemployed for a long period of time, veterans, food stamp recipients, ex-felons, persons in vocational rehabilitation, supplemental social security income recipients, as well as several other groups of individuals. 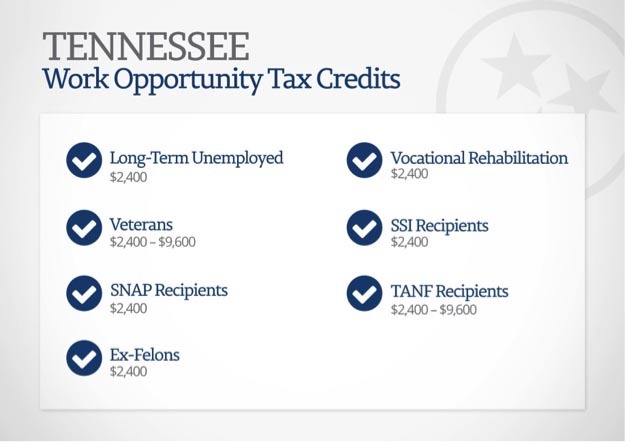 The WOTC provides federal tax credit incentives to employers who hire eligible individuals. A company can receive a tax credit that ranges from $2,400 – $9,600 per approved employee.